We treat our patients as if they were our family members. The cornerstone of our practice is to do the right thing, at the right time, for the right reason. Our commitment to your comfort ensures that you and your family will receive the most efficient and gentle dental care available today. Dr. Schapley sees all our new patients first in an appointment we call the New Patient Experience. We feel it is extremely important for our patients to have an ample amount of time to meet the doctor and to discuss their oral health goals as they begin to establish their relationship with him. Listening to and getting to know our patients is a cornerstone principal of our practice. 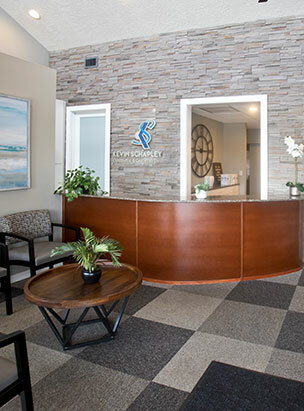 Our patients will see Dr. Schapley and the same hygienists for their appointments, which really enables us to get to know them and understand their individual oral health challenges and goals. This also helps us develop relationships with our patients and their families. Each member of our team has been with us many years, and brings decades of dental experience and knowledge to our practice. Our patients truly feel like they know our team and are assured by the consistency and strength of their relationships. There is comfort in personally knowing the people who provide your care. Dr. Schapley and his wife Terri have called North Port/South Venice their home since 2005 and love serving this community. Collecting toys for local children during the holidays, serving pancakes at the Bunny Breakfast, and volunteering at the Father’s Day Fishing Tournament are just some of the community focused events that Dr. Schapley is proud to be a part of. Dr. Schapley is also proud to be a team dentist for our Tampa Bay Rays and Charlotte Stone Crabs!